Code coverage is a great tool for making sure the code works against a set of unit tests. In this blog post I will show how to split the combined code coverage into coverage for specific commits. Having coverage by commit allows to make sure that a specific feature has been tested without drowning in the noise of the entire repo. The above screenshot shows tested-commits in action. 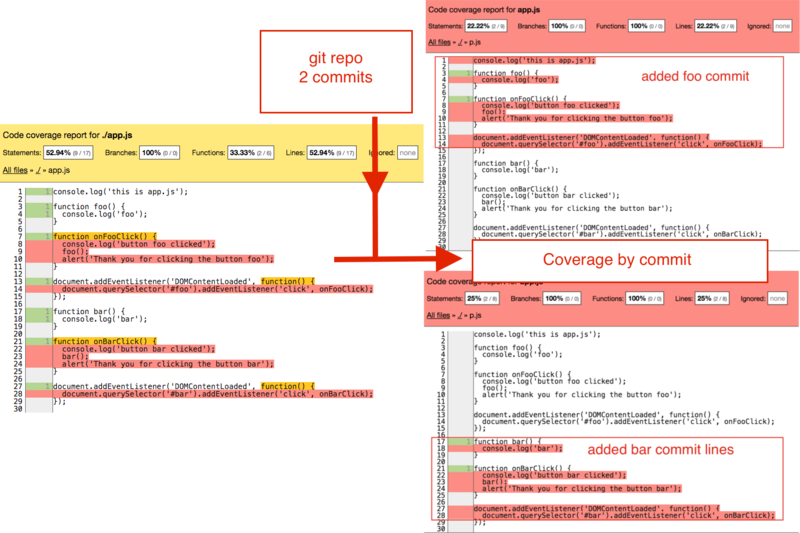 It took coverage produced by Karma and the git repo information and generated individual coverage reports for each commit. 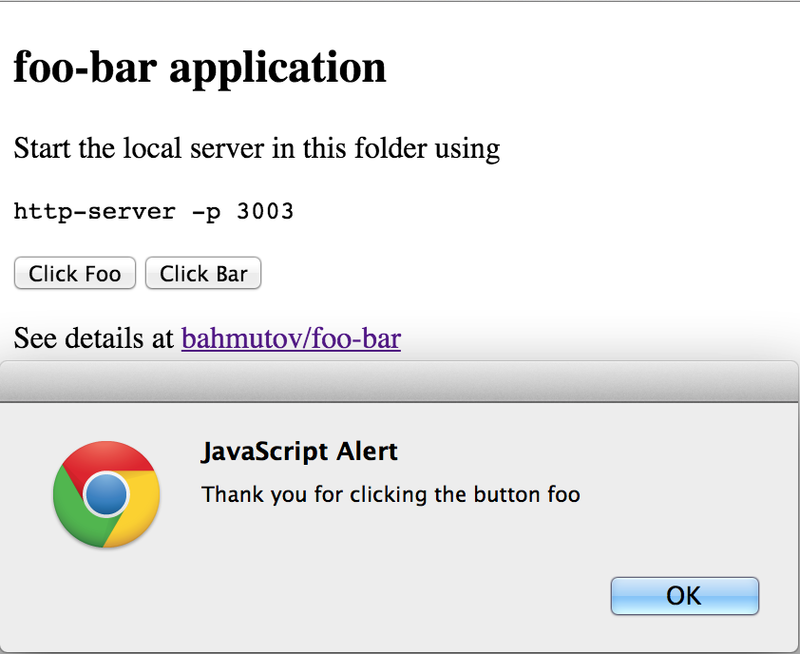 To show the tested-commits in action, I created a small repo bahmutov/foo-bar. You can follow the steps in this blog post to see the results yourself. The first commit 0137e22 added foo created the index page with a single button and a function foo. You can see the code at github/foo-bar/0137e22. Think this commit as a typical feature implemented and pushed to the repo. The second commit 1b29608 added bar adds a second button and separate function bar. You can see the updated code at github/foo-bar/1b29608. We add unit tests to the repo in the third commit 8b851be added karma unit tests. I created karma.conf.js and wrote a few jasmine unit tests that just execute foo and bar functions. You can see the code at github/foo-bar/8b851be. You can run the unit tests and see the coverage results by installing dependencies npm install and running karma. 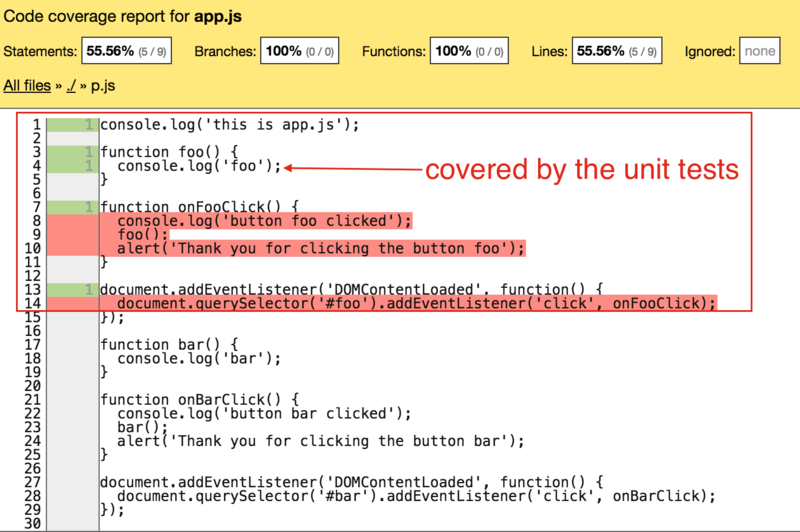 Notice that our unit tests only executed source lines inside functions foo and bar, but not click event handlers. s list in this structure shows statements that were executed during running the unit tests. Statements 1, 2, 3, 4 were covered, while statements 5 and 6 were not covered. There is a separate map that links statements to source code lines, but for our purpose it is an unimportant detail. The code coverage displayed in the above covers the entire repo and does not separate information for the two features foo and bar. Thus it is easy to confuse average code coverage across the entire repo with both features tested at the same rate. But one commit could be tested completely, while the second one could be skipped completely. This can be dangerous when used together with the branching models commonly used in the industry. Every company I worked for used some variation of the following git branching model. There is a master and several branches used to deploy to specific environments. By default everyone is committing to the master. Periodically we deploy the master to the dev server and test the app. If everything is working, we merge commits from master to staging branch and deploy to the staging server. We test again and merge to the prod branch and deploy the code to production. The situation becomes a lot more complex when some things do not work and we cannot merge entire branch from master to staging. Instead we cherry pick specific commits to bring from master to staging. Similarly, we are sometimes forced to cherry pick fixes to be applied to the prod branch. 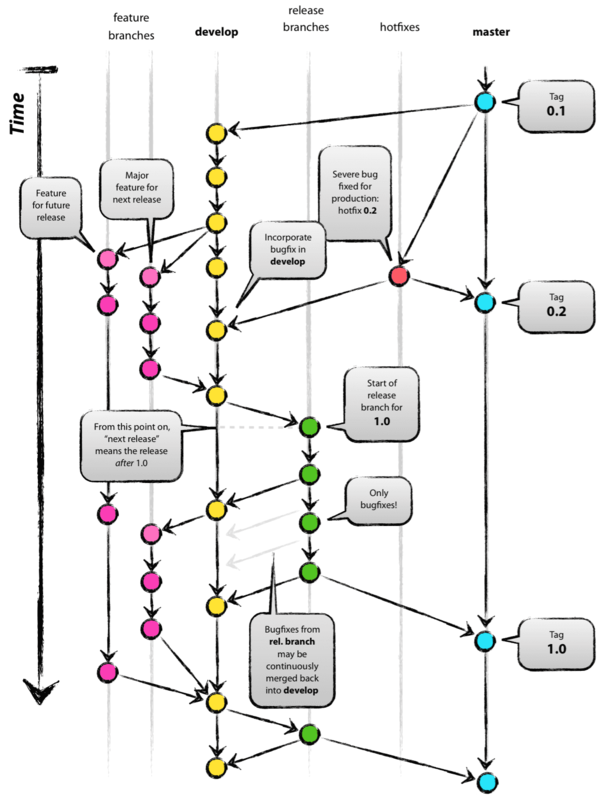 The above image is taken from the excellent blog post A successful Git branching model. We move the individual features from branch to branch using commits, but our coverage information is computed across the entire repo at the HEAD commit. 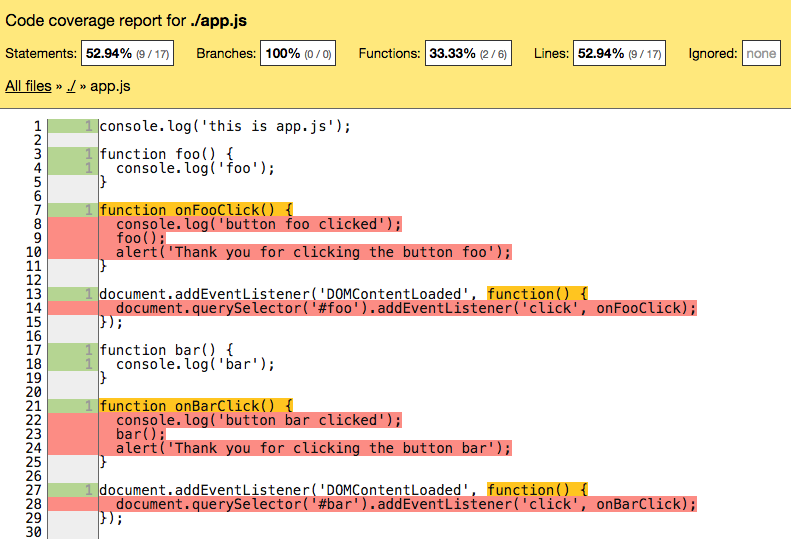 In app.js case, the first two commits are responsible for the entire file. You can get this information using bahmutov/ggit module. Using tested-commits I can take extract the code coverage specific to a single commit, or to several commits. The example below will split coverage to the last 3 commits in the repo. 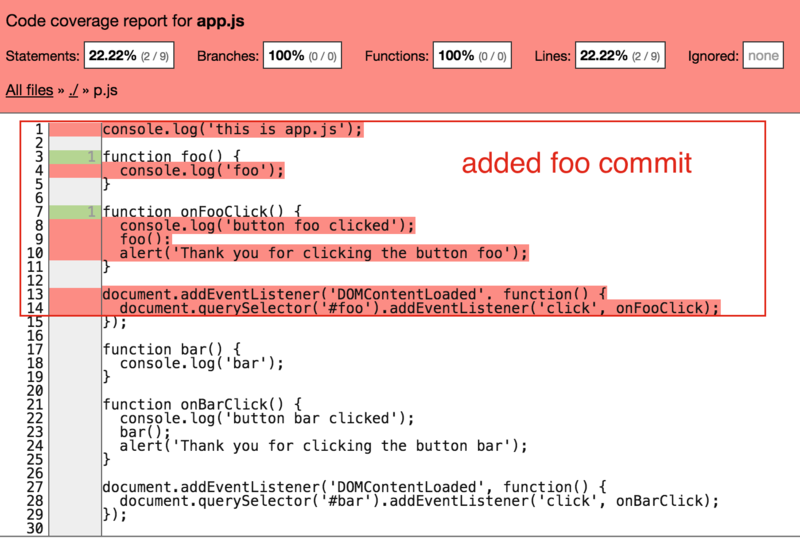 Each report shows only the lines that were modified in that commit, other lines are ignored. The 0137e22 added foo commit's coverage report only shows the lines that survived into the HEAD commit. Everything else is ignored, similarly to white space or comments. 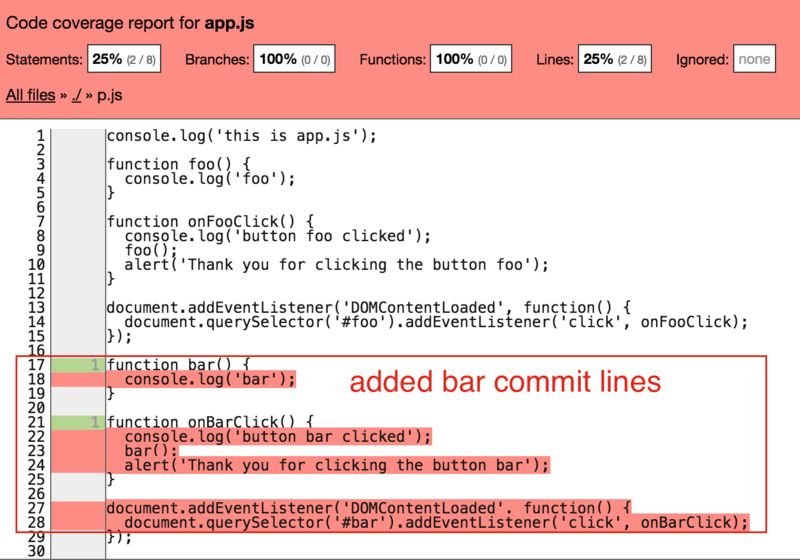 Similarly, the coverage for commit 1b29608 added bar shows information only for the lines from that commit. Again we can open the separate coverage reports using tested-commits --open command. Notice the changed information, for example the code block inside the function foo() has been covered by the unit tests. A couple of other statements have been covered too, increasing the commit's code coverage from 22% to 55%. Similarly, the code block inside function bar() has been covered. The latest commit also increased code coverage because the app-spec.js source has been fully covered. For commits that have been completely overwritten by other commits, the coverage automatically shows 100%, because there are zero lines. Splitting coverage information by commit allowed us track the testing information associated with each feature. Before cherry picking a commit, we can actually check its test status to make sure we only move reliable code between the branches.